USB A to USB mini A (OTG) cable, to power up the Beagle. Null modem cable to connect the beagle to my PC. Noticed that my power adapter has a switch to select the polarity. Had posted a query regarding to beagleboard's google group, enquiring about the polarity to be used and if the HDMI to VGA cable would work. Gerald replied back saying all this is covered in the system reference manual - which me hadn't even gone thru till then. 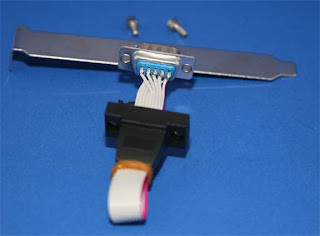 He also mentioned that the HDMI to VGA cable wouldn't work - since the signal that is output from the HDMI port is a DVI signal, and does not have neither the HDMI signal, nor the analog signal that would be required for the VGA cable to work. Thus, had to go shopping again - this time for the HDMI male to DVI-D female adapter. The beagleboard that Me'd bought was rev B6. Downloaded the corresponding system reference manual, and noticed that it had more than enough information that anyone would require to get going with the beagle board. What interested me was the board validation procedure that apparently the manufacturing would use themselves to make sure that the boards are good. Me had decided that Me'd use to check if my board was working fine. Checked my Null modem cable independently between PCs, and it was working fine. Connected the IDC10F to DB9M adapter to the beagle, and the PC on the other end using the null modem cable. Launched up hyperterminal, set the appropriate settings, and opened the connection. Was expecting the diagnostic messages to show up on the terminal when the beagle got powered up. However, that didn't happen. IDC10F(1) to DB9M(1), IDC10F(2) to DB9M(6) , IDC10F(3) to DB9M(2) and so on. IDC10F(1) to DB9M(1), IDC10F(2) to DB9M(2), IDC10F(3) to DB9M(3) and so on. The configuration that would work with beagle's set up would be the one listed in (2) above. And the adapter Me had was wired like in (1). Rewired my adapter and it worked. Me could boot up into the board and could hear the crisp sound on the audio out as well. The next step was to boot into the SD card on the MMC slot. The system reference manual detailed steps that would allow booting into the SD card and to play out a video file. It felt like an achievement to watch that video - Stephan Edberg playing a tennis match. The next milestone - to boot a demo linux image from SD card. There was a demo that Me'd seen at FOSS.IN - which had a full screen animation playing on it. Got to check that out. To go deep down or get the overview first? Beagle - a push for innovation?